Joomla! Update System support, new edition upgrade of the Joomla extension will be now announce in the backend, the upgrade process still require to login and download on joomlarulez.com. JED, Joomla! Extensions Directory Official Page, Our Advanced Extension is officially mark as Popular. If you use JW Player Module or JW Player Advanced, please post a rating and a review at the Joomla! Extensions Directory. JW Player Official Resseler, Unbranded player ! Version of JW Player support : Free, Starter, Business and Enterprise. Our Advanced Extensions are officially mark as JWPlayer.com Featured Extension. Select Cloud-Hosted JW Player (JW8.x Default player NEW ! !, JW7.x - Legacy Player) or Self-Hosted JW Player (JW8.x NEW ! !, JW7.x or JW 6.x - Deprecated Player) and by the way add automatic switch flashvars parameters according to JW version. CDN JW 8.x NEW !! Support for playback of 360 Video. Both magic window and VR modes are supported when streaming a spherical 360-degree video. RSS feeds with Media extensions (example). Audio Formats: AAC, MP3, Vorbis. ID Tag & ID3 timed metadata support. SCTE-35 Support, SCTE-35 is a form of metadata, similar to the ID3 tagging system applied to streaming media, that broadcasters have been using for years for traditional broadcast television, and now, web streams. Like ID3 metadata tags, SCTE-35 markers can be added to an HTTP Live Streaming (HLS) manifest to provide contextual and temporal metadata. In JW 8.7, the player exposes SCTE-35 CUE-OUT and CUE-IN points, as well as DATERANGE tags to indicate when there are breaks in your live stream. Amazon's CloudFront, (Amazon Web Services) offers content providers a simple and reliable way to host, format and deliver their video content at high speeds. Captions (closed captions on top of the video for each items).Now support Label (Set a name for the Language files selection) and default Language. Tracks -Thumbnails : Ssupports the loading of preview thumbnails for individual shots or scenes in a video. These thumbnails are displayed in a tooltip when a viewer hovers the controlbar. This allows for quick scanning and navigating of longer-form content. Tracks - Chapters : Supports the rendering of chapter markers within the timeslider. These work particularly well for long form video when you want your video to be segmented into discreet sections. A viewer can quickly hover over the cue point and can see the title of the chapter or section. Clicking on the cue point navigates you directly to that point of the video. HD for each items. Now support Label (Set a name 720p, 1080p... for the files selection) and default quality. Sort by date, alphabetical, random. Assign automaticaly thumbnail file (jpg, png, gif) with audio/video file (mp3, ogg, mp4, webm, aac...) associate (same name). Assign automaticaly an alternative (smaller) thumbnail that is loaded into the visible playlist. Assign defaut thumbnail (or not) with file with no thumbnail associate. Assign Tracks -Thumbnails, JW Player supports the loading of preview thumbnails for individual shots or scenes in a video. These thumbnails are displayed in a tooltip when a viewer hovers the controlbar. This allows for quick scanning and navigating of longer-form content. AssignTracks - Chapters : Supports the rendering of chapter markers within the timeslider. These work particularly well for long form video when you want your video to be segmented into discreet sections. A viewer can quickly hover over the cue point and can see the title of the chapter or section. Clicking on the cue point navigates you directly to that point of the video. Occurence filters for analyse name file for generate track number, title and description. Automatic Captions (caption file must have same name of the stream file). Automatic multiple qualities sources (hd file must have same name of the stream file + source.file in the name). Appears with a dropdown List under the player. Playlist Titles for Dropdown List choice (adress of the link, clean name of the file, or title of the rss link using curl library). Length Max of Playlist title for Dropdown List. Dropdown Style choice (defaut or using css class). JSON PLAYLIST - This is a very specific mode, reserved for advanced users!!. You can set directly the JSON playlist in a field or load a JSON playlist file (.txt,.json) as well. JSON Playlist : JW use the levels configuration block with a more flexible sources block. It is part of every playlist item. Use sources to provide multiple media formats, multiple quality levels or multiple formats with multiple qualities. JWPlatform web interface, upload (web or ftp), manage and publish single videos. JWPlatform web interface, create, manage and publish channels (playlists of videos). JWPlatform web interface, create and manage players (the widgets that play your video). JWPlatform web interface, statistics, analyze how your videos perform. Track views, pageviews, hours viewed and engagement. JWPlatform web interface, Account management, you can track your content and traffic balance and edit your account settings. JWPlatform Backend Extension, Choose streaming display : JWPlatform, combine JWPlatform to Local, combine local to JWPlatform, Local. JWPlatform Backend Extension, Sign url, your content is secure by signing link trough your secret api key. JWPlatform Backend Extension, Set time out for sign url. Choose what version of JW Player you want to use, 8.x is the default player, 7.x is the legacy player, 6.x is a deprecated Self-Hosted player, Cloud-Hosted player is available as 8.x and 7.x. HTML5 Primary : Which rendering mode to try first for rendering the player. Can be html5 (default) or flash . HTML5 Add Load jwplayer.js Automatic, force to yes, force to no. Iframe : When using sharin plugin, viral plugin, Modal pop-up, highslide pop-up, windows popup, we use iframe html page, those pages can be build by 3 ways : Build iframe if not exist (the script will just verify if the html page exist and only if not it will build the page, it use less ressources but this will not reflect modification made after the initial build), Check if iframe match (This will check if the iframe page exist and check also if it is up to date by matching if it is not it will rebuild it), and finally, Rebuild the iframe (It will re build the iframe even if it exist, this will force the rebuild, be careful this will use ressources, it is interesting only if you want to be sure to have rebuild all your iframe page, think to reset it after rebuild to the default setting, fullscreen support for iframe in embed code. Facebook embed (Load Meta Tag in HTML Head). Type the link to the Thumbnail for sharing the page on Facebook, this allow sharing the page where the page player is on Facebook, for that you will have to set this field. Please note: JW Player no longer supports in-feed video playback on Facebook. Debug , If you're having issues with a JW player compil by yourself, you should enable debugging in the JW Player. This can be done by right-clicking on any player and then clicking on 'Debugging to…'. Repeating this process will cycle through the list of available debugging options: none, trace - logs debugger output to the flash debug log. arthropod - Arthropod is a handy Adobe Air application that we often use to look at debugging output. The "Flashvars" mode will display a pre code with all flashvars load in the player. JW Player skins change the appearance of the player, adding a custom layer to your player embeds. All visual components of the player (the controlbar, display, tooltip, dock and visual playlist) can be skinned. There are two ways to get a skin for your player. The nine complimentary skins offered in JW7 have been deprecated in JW8, but customizing JW Player is easy with JW Player 8's CSS-based skinning model. To configure colors only, our 11 skin color configuration options, which can be defined inside the player setup, may be sufficient. For more advanced users, you can build your css skin and load it in the backend as JW7 does, please see our CSS Skin Reference. To configure colors only, our 3 skin color configuration options, which can be defined inside the player setup, may be sufficient. Aspect Ratio : This option, used to setup JW Player for Responsive Design, is set to the video display aspect ratio, for example 16:9. When the width of the player changes, it then automatically scales its height accordingly. When the aspectratio is set, the height option is ignored. Controls : Whether to display the video controls (controlbar, icons and dock). Can be false or true (default). JW Player wants to save you time and improve the viewer experience out of the box with our latest feature, automated player localization. Did you know that our video player contains over 50 customizable tooltips, labels for menus and overlays, and ARIA labels (for accessibility viewers who use screen readers)? Previously, you had to customize these fields in order to provide a better viewing experience on non-English language sites. It is time consuming to translate the player, so we have done the work for you so that your viewers can benefit today. Beginning with 8.6, the player will automatically translate those fields to match the language on your website. We have included support for 21 languages and will add more by request. Enjoy a seamless experience that increases clarity and engagement for all of your viewers. Added automatic localization support for six new languages: Russian, Indonesian, Korean, Thai, Vietnamese, and Finnish. NEW!! Quality Labels : Use this configuration option to apply a custom quality label to a desired bandwidth in kbps, works for HLS and DASH. DisplayTitle : Hiding the title from the play icon. Display Description : Can be used to toggle the display of a files description field. Playback Rate Controls : Whether to display a button in the controlbar to adjust playback speed. Display Playback Label : Enables call-to-action text beneath the play button on the player idle screen. Logo (Location of an external jpg, png or gif image to show in a corner of the display. ),With JW7 and 8 No commercial license is required. Logo.link, link to direct to when the watermark image is clicked on,With JW7 and 8 No commercial license is required. Logo.hide, When set to yes, the logo will auto-hide,With JW7 and 8 No commercial license is required. Logo.position, The corner in which to display the logo,With JW7 and 8 No commercial license is required. Added a new logo position option, “control-bar”, which places the logo in the control bar with an optional clickthrough link. NEW !! Logo.margin, The distance of the logo, in pixels from the sides of the player,With JW7 and 8 No commercial license is required. abouttext, The text that goes between 'About' and '...' in the right-click menu. If it is not set, no menu item will appear.With JW7 and 8 No commercial license is required. aboutlink, The URL that will be opened (in a new window) when a user clicks on the about text. If it is not set, clicking on the about text will not have any effect.With JW7 and 8 No commercial license is required. Floating Player : NEW!! In the industry, a video player that is at least 50% in view on the screen for greater than two seconds is considered viewable. Viewability is a key signal of engagement, which is why it has become the gold standard for publishers and advertisers alike. JW 8.8.0 introduces the floating player, which minimizes itself to the bottom right corner of the screen when a viewer scrolls the player out of view. It ensures nearly 100% viewability and can be easily dismissed back to its original position. Keyboards Shortcuts, Improved support for keyboard navigation in JW8. Users can tab to advance through buttons and menu options in the player, and use the enter key in lieu of a click to take action on any focused item. The escape key can be used to close overlays and menus. Added a reference dialog for keyboard shortcuts within the player, which can be accessed via the right click menu or evoked by pressing SHIFT+?. NEW!! Added a shortcut to sharing in the right click menu. NEW!! Read out the current position when focused on the time slider or when seeking. Read out the volume when changed. Auto Start (Choose Automatically start the player on load), Added config which starts playback on desktop devices when the player appears in view rather than on page load or via user click. Auto Pause: NEW!! Another way to increase average viewability is by automatically pausing the video when the player is out of view. Our auto pause feature can help you do just that. it automatically pauses the video when less than 50% in view, including when the player is no longer in the active tab. 8 introduces smarter preloading, The wait time for media to start playing after an ad goes from seconds to milliseconds in 8. Extra Flashvars , With this new features you can add with a simple syntax some flashvars not yet implement, you just have to list them and use a & to separate them, like this : flashvar1=value&flashvar2=value&flashvar3=value. Image, Text or both link. Modal Effect, using Native Joomla library lightbox. Bootstrap modal popup, compatible with Joomla 3 and 4 (Native bootstrap library), beta version. Autedetect or not Jquery load for JWBox. Load CSS or not for JWBox. Google Chromecast and Airplay, JW Player is Airplay adn Google Cast Ready, This functionality will allow your videos to be cast from a Chrome browser via the Chromecast plugin directly to a JW Player receiver app on a Chromecast-connected TV. Once the JW Player detects a Chromecast on the network, a Cast icon appears in the control bar to let viewers know they can display their content on a TV. The JW Player within the browser becomes a remote control for viewing media on a TV screen. Cast videos from Chrome on iOS using built in casting controls. Control closed captions with the JW Player support. Includes FCC caption styling support. Casting controls are available when JW Player renders in Flash to play mp4 videos. The following HLS v3 streams can now be played on Chromecast : AES Encrypted streams, Live and DVR Streams and VOD streams. Control playback and volume directly from the Google Cast extension. Includes native caption and subtitle support for casting. Improved the casting experience by starting a casted DVR stream at the live edge instead of at the beginning of the stream. NEW!! Registering with Google Cast : JW 7+ no longer uses the custom receiver application hosted by JW Player. Instead, once casting is enabled the player will connect to the default receiver application hosted by Google. Because of this, you no longer need to register an application ID with Google and all existing setups will function correctly. Sharing, Sharing is most often used in viral sharing of a video. The Sharing plugin for the JW Player can display a screen to share the embed code of the video, or a share link for the video, e.g. the URL for the page where the video is hosted.Also is displayed as a tooltip for the sharing icon. This Plugin adds sharing functionality to the JW Player. 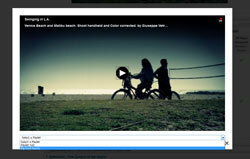 In the embed screen, an embed code for the specific video can be copy-pasted. In the share screen, a link to thesite for this specific video can be copy-pasted. Sharing Plugin supports the JW Player Skinning, and Playlists. API to triggers and hides display as well as showing which networks get clicked. Add your own custom social networks. Default networks include - Facebook, Twitter, Pinterest, Email, Tumblr, Google Plus, Reddit, LinkedIn. Related, Users can activate the overlay by clicking the Related Videos button in the top left of the display. Additionally, the overlay can be popped up automatically when a video is completed.The plugin automatically renders a grid of thumbs, showing as many as fit the screen. Buttons for re-playing the video and for closing the overlay are shown in the top corners.Also is displayed as a tooltip for the relate icon. Introducing a new user interface for our Recommendations customers: the shelf widget, which dynamically inserts a horizontally-scrolling carousel of thumbnails directly below the player. In contrast to the in-player shelf, which is only visible on pause and when the viewer manually opens it themselves, the new widget interface is always viewable below the player. Automatic Related Playback with configurable countdown timer and message. New API to triggers and hide display as well as show which video gets watched. Updated design for showing recommended and related content. Added a new recommendations interface called Recommendations Shelf, which allows viewers to browse JW Recommended videos throughout the playback experience. This feature, available to all customers with a Recommendations entitlement, will provide more paths for engaging with content that is most relevant to your audiences, ultimately deepening engagement and powering additional monetization opportunities. Added a new recommendations interface, the shelf widget, which will place a recommendations shelf directly below the player, outside of the player’s container by setting related.displayMode to shelfWidget. Improved responsive scaling of the shelf widget when using the selector configuration option to decouple the width of the player from the width of the widget. Google Analytics Pro, This plugin for the JW Player is designed to help you understand how well your video content is performing online. It takes advantage of Google's new Flash API for Analytics so you can track events within the JW Player itself. The tracking of events (which includes allowing you to access information about not only what videos are watched, but how long users watch each video), aggregates it, and passes along the relevant information for easy and concise tracking within Google Analytics.we support Google's gtag.js. More information on Google's Universal Analytics upgrades can be found here. Added support for the most recent Google Analytics embed type, gtag.js. Older types of embeds are still supported. The player now marks events sent to Google Analytics nonInteraction: true if they were not manual viewer interactions. This enhancement increases bounce rate accuracy . JW Analytics, Website Statistics. JW Player 6 offers a set of hosted services that augment the functionality of the client-side JW Player library. One of these services is JW Player Analytics, which provides basic video analytics to all users of the JW Player. Video analytics can be found inside your JW Player Account (it also holds your download zip and license key). Analytics are automatically enabled when a valid player license key is setup. HD , On desktop browsers, JW Player add an HD quality toggle to your player embeds, allowing users to switch between multiple qualities of your videos. If there are 2 file qualities, the HD button acts as a toggle between the HD and SD qualities. If there are 3 or more file qualities, the HD button will display a quality selection menu on rollover (like YouTube). If there are 3 or more file qualities and the viewer is on a mobile device, JW Player will still toggle only between the first 2 qualities. This to keep the interface easy to use with Touch controls. As a publisher, you can set which quality to use on startup. The first quality in the list is the default and should be the lower quality version of your file. Once a viewer clicks the HD button and overrides the quality, JW Player saves that in a cookie for subsequent videos. Improved the playback experience by maintaining quality between videos in a playlist. The player starts subsequent videos in an embed with the quality that most closely matches the previous item based on bandwidth comparisons. Improved the playback experience by preserving the viewers bandwidth estimation and using it to select an initial quality level when playback starts. External captions can be in WebVTT format, which is part of the HTML5 standard. Additionally, SRT and DFXP are supported. In all cases, the captions are stored and served as separate text files. Embedded captions can be in TX3G format, which is part of the MP4 standard. The captions are stored inside the MP4 video files, requiring no separate downloads. FCC Captions Compliance by supporting further customization of caption styling options. 608 captions in HLS streams for Microsoft Edge. Updated captions support in Firefox and Internet Explorer to allow more styling control. Add renderCaptionsNatively parameter, If true, captions render using the browsers renderer. Extra Plugin , With this new features you can add with a simple syntax some plugins not yet implement, you just have to list them and use a comma to separate them, like this : plugin1,plugin2,plugin3. VAST 4- Compliant ad server communication, HTML 5 compliant. VMAP - Able to parse ad schedules from a VMAP tag. Included the Skip button in the vpaidcontrols configuration’s functionality for the VAST plugin. Included the duration present in the VAST XML on the adImpression event. MediaFile compliance metadata from VAST4 tags to Vast plugin API events, including the reason the tag was not compliant. Support for m3u8 MediaFiles in ad tags in our Vast plugin. Add podmessage configuration, Text that displays during playback of an ad pod. Ad preloading functionality in the VAST ad plugin to include preloading the preroll of subsequent playlist items. Improved ad rendition selection in Freewheel by passing the player s bitrate estimate to the AdsManager.NEW!! Added a new bidding configuration option, no_vpaid_ads to the optionalParams object, which restricts VPAIDs and only serves mp4 ads with no SpotX VPAID wrapper.NEW!! Added pause reasons to the response for on(adPause) in the VAST, IMA, and Freewheel clients.NEW!! Ungated VAST 4.1 tags, enabling ad tags marked with the latest VAST version to play. VAST 4.1 features that are not yet supported in JW Player will be ignored.NEW!! Added (automated localization)[https://support.jwplayer.com/articles/translate-video-player-text] of all Google IMA text to match the player s language. Developers may also declare a two-letter ISO language in advertising.locale. NEW!! The Google Interactive Media Ads (IMA) SDK enables publishers to display linear, non-linear, and companion ads in interactive media content such as videos and games. Publishers can use the IMA SDK to request and display ads served by DoubleClick for Publishers (DFP), the Google AdSense network, or any VAST-compliant ad server. Common scenarios for using the IMA SDK include displaying pre-rolls or overlays in video content.Support for the updated Googima IMA API. Note: In-video ads served by Google's Dart For Publishers (DFP), supported through the Interactive Media Ads (IMA) SDK version 3. JW Player is one of Google's official video technology partners. Passed the results of the autoplay restrictions check to the ad plugin. Improved the IMA ads UI to account for Google ads with built-in skip buttons, countdowns, etc. Created a new configuration property for VAST and IMA, preloadAds, which enables ad preloading for prerolls, midrolls, postrolls in the first playlist item. Add maxRedirects configuration, The maximum number of redirects the player should follow before timing out. Add bids configuration, Enable video player bidding with the given settings and bidders. Add rules configuration, Enable ad rules with the given settings and bidders. For Video Player Bidding, expanded the number of possible bidResults to include expanded error tracking. For Video Player Bidding, added the priceInCents to the adImpression and adError events for all mediation layers. For Video Player Bidding, created a new mediation option when the SpotX bidder is in use jwpspotx which allows SpotX to act as the primary adserver. For Video Player Bidding, created a new mediation layer JWPDFP that combines both existing mediation layers (JWP and DFP), allowing the SpotX bidder to take advantage of the benefits of both mediation layers. Expanded the on(adsManager) event, which fires when the ad manager is loaded, to IMA. This event can be used to integrate with third-party vendors. Advanced support : Priority Support, Response times have priority over Basic users. Profile and Forum Badge. Player error coding and classification system documented in new Error Reference doc. 5.6.x, 7.0.x, 7.1.x, 7.2.x NEW! !, 7.3.x NEW!! Extension is validate as XHTML 1.0 Transitional! and for sure HTML5 compliant. Extension is validate as CSS level 2.1 ! GDPR compliance for data transparency to assist customers whose viewers request access to their data. XTD Editor Plugin, Version 2.4.0, 27 december 2018 NEW!! Prepare the compatiblity to Joomla 4. Remove compatibility with Joomla 1.5. Joomla Update system is now fully support, you will just have to set your download ID in the backend of the extension and save it, once done, you will able to upgrade your extension troug the Joomla admin interface without download it first on joomlarulez.com. You can retrieve your Download ID on Joomlarulez.com : User menu --> Download IDs (https://www.joomlarulez.com/download-ids.html), Generate Download ID there. You can generate multiple Download IDs. Each Download ID can only be used for one website only. So if you use your extension on multiple websites and you have the right license, you will have to generate multiple Download IDs, each Download ID can only be used for one website only. JWPlayer.Key Field : All player editions have been merged into a single binary, your license key will automatically activate the edition you have purchased. (Note : Instead set it in the dedicate field, you can also load it in a obscufated file). AS JW8 and 7 All embeds require a valid license key to work. (Please Read the FAQ for more explanation).